You guessed it, memory foam running shoes are running shoes with memory foam insoles. The memory foam is usually made from polyurethane and other chemicals to make up its density. The foam is temperature sensitive, which enables the feet to mold to the memory foam. They are designed to enable a more comfortable run due to the even distribution of balance. 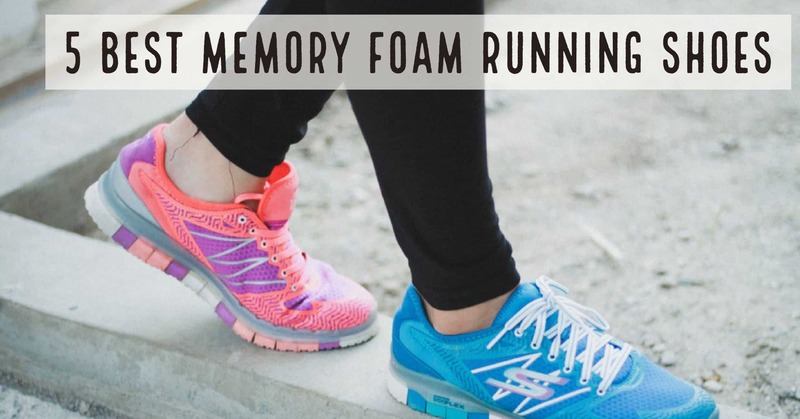 Memory foam running shoes are becoming more popular over time. Also, every major running shoe brand has its own memory foam technology and designs to make their shoes more competitive in the market. At the same time, this competition creates options for runners to meet their needs. Here are the five best memory foam running shoes for 2019. ​Running in these shoes feels like running on clouds. The shoes feature memory foam that molds to the feet for support and stability, and it has a lightweight outsole for ultimate traction. Another feature includes a durable, well-rounded design that makes it suitable for other athletic activities besides running. A combination of lightweight leather and synthetic materials are used for this design. The design also helps hide wear and stains in order to keep its presentable look. This model comes in three different design options. It is an efficient shoe for running and other athletic activities due to the price and durability. The combination of low price and durability makes it easy to replace shoes if needed. Overall, the Fila Maranello 2 Running Shoes provide good support while decreasing foot stress. One of the fancy features of these shoes are the material. The Carrara has soles made of durable, flexible rubber. The lightweight material is part of the Ryka technology, so it decreases fatigue in the feet. Also, it is constructed to allow breathability and comfort to prevent foot strains. The value is the next reason to purchase these shoes. The Carrara is inexpensive, and it is easy to get multiple pairs or replace worn out shoes. They are suitable for speed or longer runs. Heathered mesh with synthetic overlays. The Sketchers Sport Equalizer 2 is the new and improved version for its predecessor version 1. Its predominant features are the technologies. It's made with all synthetic materials for lightweight feel and improved breathability. The price value of the Equalizer 2 makes it affordable and the best option for running shoe. It reduces foot strain and fatigue like any other brands, which enables the runner to perform at their best without compromising price. The Saucony Kinvara 5 is even faster and more comfortable than version 4. Some of the material has been replaced with iBR+ rubber to add more durability and cushioning on the outside of the foot. The outside of the foot is where more wear and tear happens. Saucony customer requested for a more smoother and softer lining next to skin and sock, and Saucony delivered that request with a RunDry material. Besides the iBR+, there are a couple other technologies built into the shoe. One type of technology added to this shoe is the ProLock, a dynamic fit system. The system moves and flexes with each stride. In addition, there is a heel crash pad, and its purpose is to give a smoother ride through the gait cycle. The Power Grid is in the heel, and it contains Powerfoam and Grid technology for responsiveness. The removable memory foam sole is the big advantage because it helps prevent overpronation. Landings are more smooth with the Heel Semented Crash Pad. These shoes are priced inexpensively, which makes them easy to replace. Each shoe mentioned in this article has its own features, which makes it easier for a runner to meet his or her needs. For example, the Fila Maranello 2 can be used for other athletic activities, whereas Ryka Carrara is made for longer runs. The price of the shoes listed in this article also comes in various price range to fit any budget.